When it comes to athletic performance and bodybuilding, it seems that people will go to great lengths to gain a competitive advantage at all costs. Earlier in his life, 20-year-old Tim Duchesneau saw his health fall to the wayside in the relentless pursuit of this edge. The product Duchesneau is referring to is called Jack3D (pronounced “jacked”), an over-the-counter dietary supplement by USP Labs. Jack3D is one of many popular “pre-workout” supplements that have been on the market since the late 1990s, though its original formula was recently banned by the U.S. Food and Drug Administration due to safety concerns. Jack3D is not alone in the pre-workout market. Legal stimulants such as C4, Assault and N.O. Explode are marketed to give similar benefits. Workout supplements have been popular among consumers for some time. As early as 2007, Americans spent an estimated $14.8 billion on non-vitamin, non-mineral “natural” products, according to National Health Statistics Reports. That “superhuman” feeling that users experience from Jack3D comes from the excessive amount of caffeine (150 milligrams per two-scoop dose) as well as an ingredient called methylhexanamine, commonly known as DMAA. “DMAA causes pressure activity in the cardiovascular tissue,” said Dr. Daniel Fabricant in a telephone interview. Fabricant, director of the Dietary Supplement Division at the FDA, understands the specific bodily hazards of the chemical. According to Fabricant, the agency has received 42 adverse reports on DMAA, including issues of cardiac, nervous system and psychiatric disorders, and even death. An adverse report indicates a strong likelihood of connection between the product and these effects. As is true with artificial stimulants, there is a steep crash that follows the high. Nathan Archer played defensive back on Northeastern’s club soccer team this year, and has experienced intense withdrawal symptoms after continued use of pre-workout supplements. In April of this year, the FDA forced a discontinuation of all pre-workout formulas that contained DMAA. The agency was influenced by five deaths reportedly caused by Jack3D, including U.S. soldier Michael Sparling and British marathoner Claire Squires. Members of USP Labs fired back, saying their product was a dietary supplement, and that the chemical compound was an natural extract from rose geranium. After reviewing the scientific reports presented by the company, the FDA determined no such evidence existed to suggest a connection. Since April, all DMAA-based training supplements have been off the market, but it is not the only compound that has sparked controversy. Last year, two athletes were banned from international competition for failing U.S. Anti-Doping Agency drug tests after taking Craze, a supplement designed by Driven Sports that recently was awarded “Supplement of the Year” by Bodybuilding.com. Upon investigation, Harvard researchers discovered a high level of “phenylethylamines” in Craze, which according to Fabricant is the chemical class that includes methamphetamine, a powerfully addictive illegal stimulant. The strain of phenylethylamine found in Craze is called N,alpha-DEPEA, and although it was not listed on the label as an ingredient in the formula, researches discovered each serving contained 21 to 35 milligrams of the stimulant. Driven Sports is currently under investigation. The USADA is not the only organization taking notice to these pre-workouts. The NCAA recently posted a “Nutritional/Dietary Supplements” section on its website, warning players of banned drugs aside from DMAA found in many of these supplements. NCAA athletes know the danger of pre-workout supplements. Since these products are not always well regulated, they can often result in accidental positive drug tests. For Abare, a junior biology major who plays offensive tackle for Colby, consumers are pressured by the supplement industry to believe these products are “necessary” for strength and athleticism, and this is where a lot of the marketing success for pre-workout comes from. According to athletes and trainers, though the artificial energy boost from pre-workout supplements can be useful, nothing compares to a quality diet. “I say the best pre-workout for my guys is food, something low in fat that doesn’t cause gastrointestinal distress,” said Horne, who also works as the strength and conditioning coach for the Northeastern men’s basketball team. Pre-workout supplements are still very popular among bodybuilders, people whose daily life revolves around a healthy diet, a steady workout plan and a strict supplement regimen. 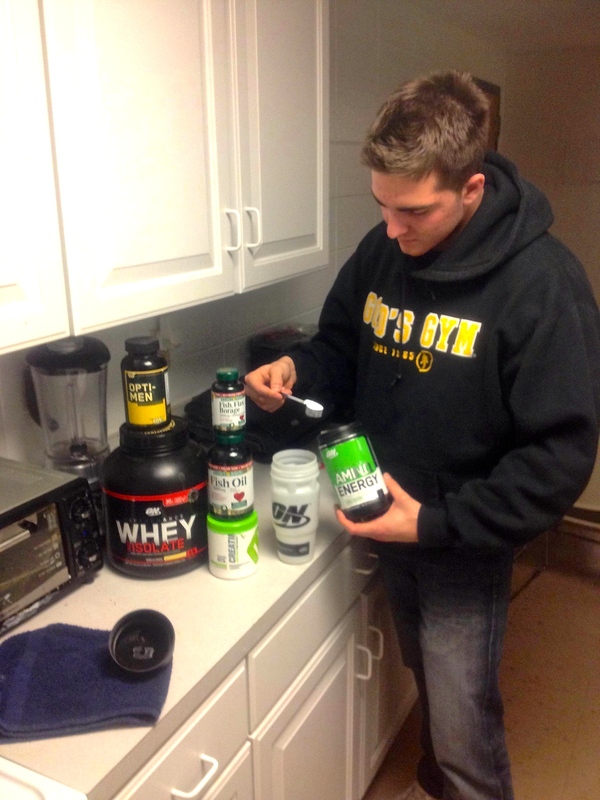 Due to his earlier health scare, Duchesneau has become much more careful with his pre-workout doses. The energy boost is essential to maintain the intensity of his lifts and to continue “making gains.” For him, working out is everything.